As many of you know, my daughter experienced multiple instances of neglect while in the care of Families First Support Services in Shelby, NC. After finding a great deal of difficulty in reporting what happened to my child, as well as to find other instances where agencies have been reported for abuse or neglect, I have decided to bring it public. This will be a series of posts, not in a particular order as there is a mountain of information I am sorting through right now. I do not believe any parent would knowingly put their child in harms way, but as it stands, parents have NO way to know if an agency or facility has been reported for abuse or neglect. I have spent the last two months making literally hundreds of cold calls hoping to find a way to hold this agency accountable. I have been randomly lucky and will be sharing those agencies who have been helpful as well as those who were not. 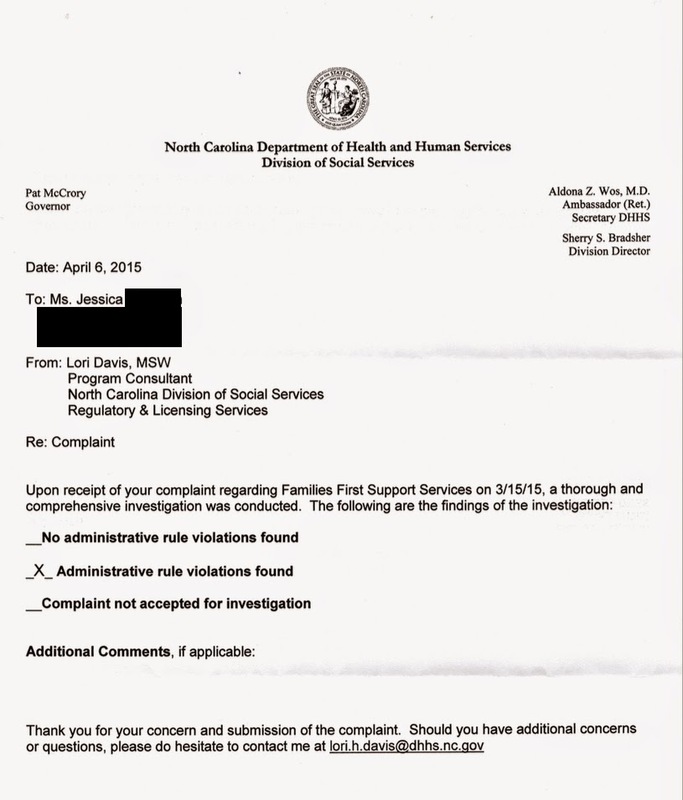 I am grateful to say that Lori Davis with the NC Department of Social Services: Regulatory and Licensing Division has been very helpful and proactive in getting the information necessary to prove that FFSS violated various administrative rules. I am currently unsure of what happens now but will keep you updated. The difficulty in reporting what are well documented instances of negligence has been incredibly distressing to me, especially considering the fact that McDonalds has to display their health rating and a complaint number. Are our children not more important than a hamburger?